With the cold and icy weather hopefully out of the way now is the time when you should be thinking about repairing pot-holed tarmac surfaces. Pothole repair is often overlooked but in fixing the problem sooner rather than later then you can save yourself a lot of money. What causes potholes to develop in our roads, paths and drives? In basic terms pothole repair is needed because rain water seeps into cracked tarmac and in doing so it will wash away any dirt which is underlying as well as any surface-supporting gravel. When the temperature is cold enough it causes the water within these voids to freeze and thus the water expands. When the water expands to form ice it occupies a space which is greater than the water and this repetitive pattern of water entering the void, freezing and then expanding and thawing creates the force which breaks up the tarmac of many roads, yards and driveways. Any tarmac which has been broken up in such a way is extremely unsightly but in more serious terms the potholes become hazardous and can cause injury to people as well as damage to cars and other vehicles on the roads. Our tarmac repair product Ultracrete is versatile cold lay asphalt and is the only tarmac repair product currently available on the market which holds both BBA and HAPAS approvals. 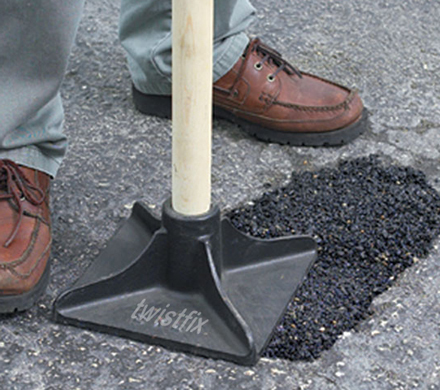 It is easy to use and thus is the perfect solution for any emergency pothole repair. What is great about this product is once it has been laid the repaired tarmac can take foot and vehicular traffic in most conditions. 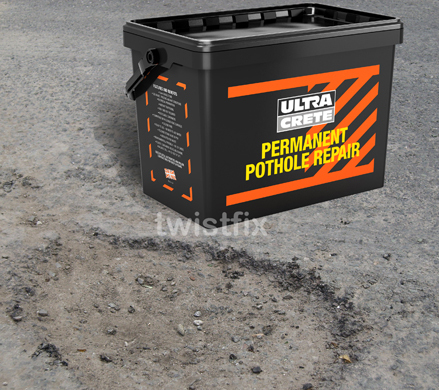 In addition to this the pothole repair product Ultracrete is a permanent method of fixing the potholes and forms part of our grounds maintenance product range. If you are sick of looking at unsightly potholes on your driveway and are thinking about pothole repair then speak to our expert team at Twistfix who are on hand to help and advise you every step of the way.